Prospects are more visible than ever, with projections and rankings abound. Yet some talent still manages to slip through the cracks. The Front Office shines a light on overlooked NBA hopefuls. Even the most focused of evaluatory gazes can miss things, and the 24/7 cycle of attention still doesn’t have room for everyone. Sometimes it’s context, sometimes there are starrier teammates, and oftentimes it’s something else entirely, but there are always undervalued prospects who find ways to exceed expectations. There are cases in every draft range. Donovan Mitchell never quite worked his way into the top tier of prospects, but has been a revelation for Utah. Draymond Green wants to remind you he was a second-round selection. Of course, that’s not to say that these guys are those guys, but with the college season inching toward tournament time, it’s nice to spread the love and give some additional shine to prospects who for one reason or another aren’t quite as appreciated as they should be. Although Marvin Bagley and to a lesser degree Grayson Allen have been the center of attention for the Blue Devils, Carter has a more substantial case than you think as Duke’s best player this season. Scouts view his game as extremely well-rounded, and he appears likely to crack the lottery given the way he’s produced. Carter leads the team’s regulars in field goal percentage, true shooting percentage, defensive rebound percentage and blocks per game, coming on strong in conference play and showing the diversity of his skill set. There really aren’t many holes in his game, and he’s been a central figure in Duke’s success. Bagley is a talent deserving of his own plaudits and comes with a more projectable ceiling due to his explosiveness and ability to play above the rim. Carter is often critiqued for a perceived lack of elite athleticism, but it pertains more to his quickness off the floor, as Carter moves his feet pretty well and has stepped up defensively in recent weeks as Duke’s chief rim protector. We often get caught up in physical ability when scouting players, but in reality there’s a wider athletic spectrum in the NBA than perception indicates. Carter has improved his body and stands a legitimate 6’10” with a 7’3” reported wingspan, adequate for a center. He does a lot of things that remind me of Kevin Love, and Carter is physically superior at the same stage. As he develops his jumper, which some scouts believe will come around in time, there’s some added upside. The funny thing about this Duke team is that its structure might actually be hampering both Carter and Bagley a little bit, given how they’re deployed. 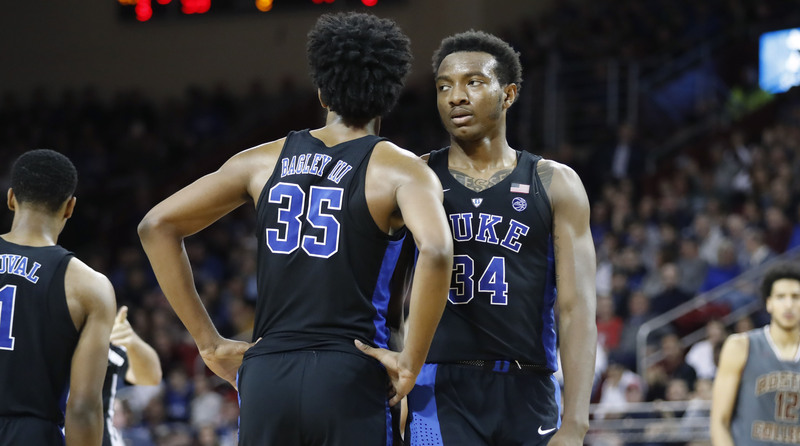 The Blue Devils lack a creative element on the perimeter and the spacing has not been ideal, and though their bigs are skilled enough for it to work, offensively neither one has been fully unlocked. Trevon Duval has distributed the ball effectively enough, but his lack of a consistent three-point shot allows defenses to collapse. Grayson Allen and Gary Trent space the floor, but there’s not much secondary playmaking. For Carter, this has meant a variety of responsibilities, and he’s been up to snuff. NBA teams have taken notice. Alkins has been a crucial part of the Wildcats’ success when healthy, and probably deserves a little more of the focus as March approaches. The Wildcats have been paced statistically by DeAndre Ayton all season, and it’s understandable that national attention would center on a potential No. 1 pick. Arizona has an experienced, efficient backcourt scorer in Allonzo Trier. But after missing the first part of the season with a foot issue, Alkins has begun to hit his stride. The foot issues have cost Alkins 12 games this season, but when he plays, he’s narrowly used more possessions than Trier. The Wildcats’ narrow usage tree makes the value of those numbers somewhat moot. They do, however, point to his actual utility to the team—he’s shooting 39% from three on a team that’s struggled to find consistent options on the wing. Alkins has been wearing a walking boot as a precaution since re-aggravating his foot in January, and after a 20-point showing against USC in Tuscon on Saturday looks to be back in form. Arizona has handed heavy minutes to its starters, who have been a quality offensive lineup but have also been forced to make adjustments. Ayton spends a lot of time floating around the foul line and busting up zones, and Trier has been much-improved in terms of picking his spots this season. When Ayton and Ristic are in together, teams pack the paint. It’s meant Alkins has often operated in the corner and been forced to dribble into crowds. He was excellent in the combine environment a year ago, and could benefit from additional space to use his explosiveness and attack off the dribble. There’s reason to think his arrow will trend upward over the next month or so. 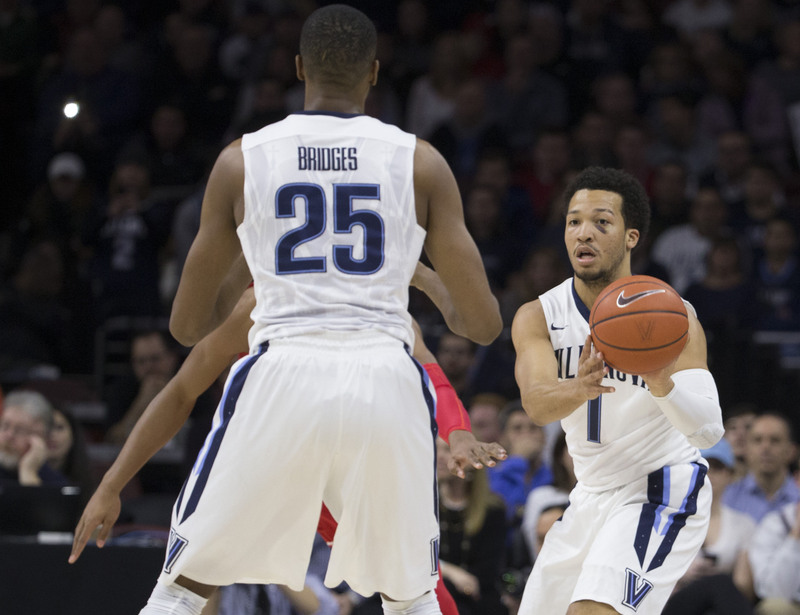 There’s little arguing that Brunson has landed in an ideal situation at Villanova, where he’s running the team as a junior, putting up terrific numbers and leading the Wildcats to a likely No. 1 seed in March. Although teammate Mikal Bridges is the surefire first-round pick on the roster, perhaps overshadowed still isn’t the exact right word. But Brunson hasn’t received the buzz your typical player of the year candidate might, and he definitely warrants added recognition as a legitimate NBA prospect. Brunson has been wildly, mercilessly efficient this season, rating as “excellent” on Synergy as a pick and roll ball handler, in transition, in spot-ups, in isolation, on post-ups (!) and yes, off screens. There is no offensive situation that makes him uncomfortable. The various ways in which heady veteran college point guards are often described can get repetitive, so pick your own adjectives, but there just aren’t many better ones around. He has a wealth of big-game experience and thinks the game at a high level already. If there’s anything to pick apart with Brunson, it’s a dearth of any elite physical tools, but when you look at the other point guards in his range—Landry Shamet, Devonte Graham and Aaron Holiday are the chief names at this stage—you’ll find that all four are in a similar boat there, unless you want to split hairs. You can ascribe the same issues to Trae Young, who’s set the world on fire at Oklahoma and set himself apart as the draft’s top point guard. But while the conversation waxes and wanes, don’t lose sight of Brunson, who should be an NBA player for a long time. This is semi-cheating, given Michael Porter has been injured all season, but Jontay has come out of his brother’s lanky shadow somewhat in the meantime. It’s one he’s inhabited essentially his entire life, as the Porters transferred high schools together from Missouri to Seattle, and then Jontay reclassified to make the college jump with Michael, who is about 15 months older. And with that in mind, his flashes of skill as one of the youngest players in all of college basketball shouldn’t be discounted, particularly in a year where the first round might thin out quickly after the lottery. That’s not to say Porter should turn pro—common sense says he probably shouldn’t. He needs to work on his body, has played just 58% of Mizzou’s minutes and hasn’t always made an impact on games as a scorer. The Tigers are undefeated when he scores in double figures. On the other hand, as always, the less time teams have to pick you apart, the better it can be when it comes to the draft. Porter’s mix of size, shooting and playmaking at 6’11” is unique, particularly when many of the big men in the middle range of the draft are more pure athletes than they are guys with strong basketball feel. You can argue that Porter’s intangibles and his baseline feel at age 18 actually offer him more upside than a number of players in the mid to late first round. Like Wendell Carter, he should be athletic enough, and in spite of lacking explosive verticality, has been among the better rim protectors in the country in terms of block rate, according to KenPom data. If he goes back he’ll have a chance to engineer more of Missouri’s offense, but if he comes out, he’ll be a worthwhile flier. Jones didn’t show up on Alabama's campus as the freshman people were talking about, and he still isn’t—Collin Sexton is the engine of the team. But he’s certainly taken on a large enough role to get himself noticed, despite Sexton, Donta Hall and John Petty all making cases to play at the next level. Jones is a local kid from just outside Tuscaloosa, and while much of the SEC was on his trail, was considered a three-star recruit and entered without much fanfare. Braxton Key missed the first month of the season, and the gangly Jones emerged as a useful combo forward with an attractive toolkit of skills. Why is Adidas Still Paying Derrick Rose Superstar Money? The efficiency numbers don’t love Jones right now, but he’s also taken less than 15% of Alabama’s shots while on the floor and gets a bit of a hall pass given the context of his role. In a case like this, it’s all about the flashes, and Jones has been able to defend multiple positions, spend time handling the ball and fill a variety of spaces on the floor. He’s shot the ball well from three in a tiny sample size. There’s definite upside here, as his length will allow him to be impactful on both sides of the ball if he’s able to pack on muscle. Jones is more of an idea than a prospect right now and will need to go back for another year or two. But beyond Sexton, he has arguably more upside than anyone else on a talented Alabama roster. His January performance against Oklahoma was an impressive moment, as he stayed on Young pretty well defensively and added 14 points in an active offensive showing. Assuming Petty, Hall and Dazon Ingram are all back next season, a more mature Jones will have a chance to put it all together. It’s worth keeping one eye on him next time you watch the Tide.